As I mentioned previously, I’ve said goodbye to Cisco and so has my partner-in-crime when it comes to all things technical. The only problem is where do you go from there with regards to wireless networking? Around the same time, Ars Technica did a review of the Ubiquiti UAP-AC range of access points. The AC range has two main problems though. Firstly, it’s not available in the UK at the moment. Secondly, it doesn’t yet support zero handoff roaming, which allows you to move between two separate access points without needing to reconnect. Given 802.11ac wasn’t a pressing requirement though, he decided instead to get the £150 UAP-Pro. An installed UAP-Pro. The blue status light means it’s configured and connected. It’s worth repeating the same warning that Ars Technica gave to anybody thinking of purchasing one of these devices: They are only access points – designed to connect wireless devices to a wired network. They are not a replacement for a home router. The UAP-Pro comes in a nice box, supplied with a backing plate; a mounting plate for use on ceiling tiles; and a power injector since it does not support being self-powered. The UAP-Pro itself is about the size of a frisbee, and it weighs about the same as too. When compared to the all-metal Cisco 1252, it feels like its a toy. 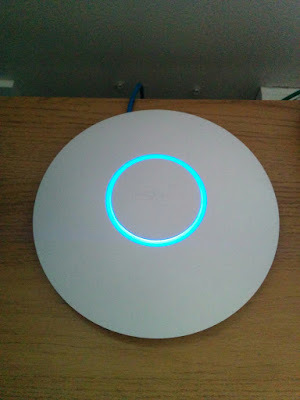 Physical installation of the UAP-Pro is simple enough. On the back of the access point is a mounting plate with a locking lug. Press the lug in and rotate the access point clockwise relative to the backing plate. This exposes two ethernet connectors and the reset button. Installing this UAP-Pro merely involved taking out the cable entry cover, plugging a patch cable into the primary socket, and reinstalling the back plate. The patch cable plugged into one of the patch ports on the wall. At the network cabinet, the patch panel socket for the UAP-Pro was connected to the POE socket of the power injector, while the LAN socket connects onto the switch. If you have a switch cable of supplying 802.3af compliant POE, then you don’t need to use the power injector. With that, the installation is complete. The UAP-Pro will light up, its status light being nicely integrated into the centre of the device. A solid white light will tell you that it’s time to proceed. With a Cisco Aironet, you can take it out of the box, connect a console cable to it, and then configure it fully before it ever sees an Ethernet cable. Not so with the UAP-Pro. Without the software controller, the analogy to the Frisbee is quite accurate. Ubiquiti’s controller software is easy to install and works on all the major platforms. The downside is that it’s built on Java. This comes back to bite later. The other major problem with Ubiquiti’s offering is their documentation. Sure, they have some, but how useful it is is debatable, since it doesn’t explain how to set up your network, just where everything is. The trick to a successful install is to install and configure the controller software before associating devices with the controller. Making some changes after the system is configured can cause the UAP-Pro to be unable to connect to the controller. At this point the only way to reconnect it is to log onto it using SSH, factory reset it, and then readopt it from the controller. Once the controller has adopted the UAP-Pro, a configuration is pushed to the device, and the controller is no longer required for continuous operation. Keeping the software however does give some advantages such as the ability to monitor access points and clients; manage seamless roaming between multiple access points; and visualise network coverage. The UniFi status window. 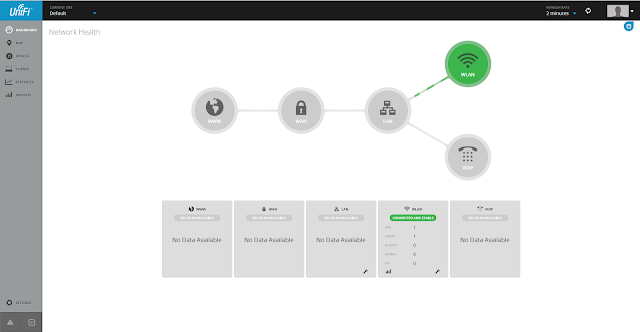 From a single application you can control Access Points, VOIP Phones, Switches, Firewalls, and Routers from Ubiquiti. All without licencing or additional fees. 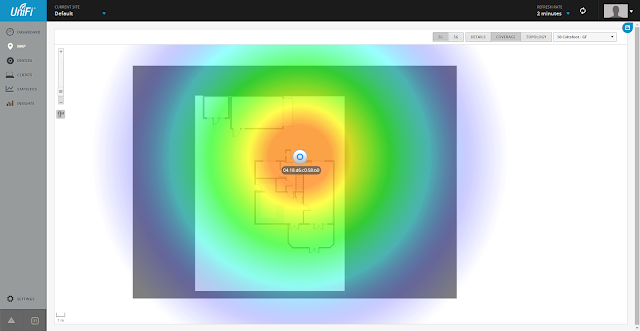 The approximate range of the UAP-Pro in 2.4GHz mode superimposed over a building plan. The only downside of this is that the building plan is only an image – it can’t calculate signal attenuation from walls etc. It also only works in 2D – You can’t see how well it propagates across floors. If you’re a business and you’re looking to install high quality wireless networking without paying the Cisco tax then you’re actually spoilt for choice. Coupled with the fact that there will be somebody that can install the equipment from whatever manufacturer you choose, you’re laughing. 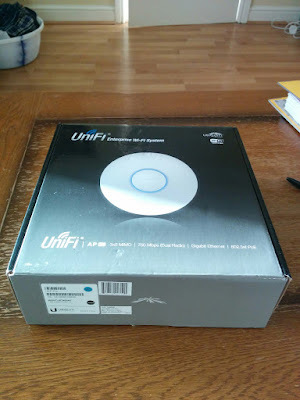 If you wish to go with Ubiquiti and the UAP-Pro, then I’d happy recommend their use based on what I’ve seen to date. What however if you’re not a business? Or you don’t want to pay somebody to come in and set everything up for you? The short answer is it depends on your technical expertise. The lack of a built in Web Server means that you’re obliged to use the Java-based controller software at least once to configure it. Once you have done so, a controller isn’t required for ongoing operation. You’ll also need a little bit of networking knowledge. If this isn’t you, then look elsewhere, with the UAP-Pro is going to cause you a world of pain. If you do have the skills though, the UAP-Pro looks to be a very competent access point, and is certainly a cut above the SOHO-grade access point.